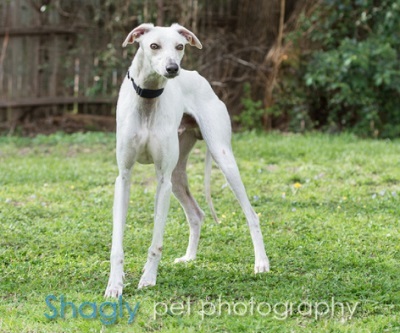 Tod is an approximately 2.5 year old white male found as a stray at the intersection of Highways 287 and 360 in the Mansfield, TX area. He along with the other three found together make up the Mansfield Four. Tod, Zelda, Vixey, and Squeaks were rescued by The Forgotten Ones Rescue and transferred to GALT immediately. Tod has been treated for a positive titer to Ehrlichia Canis, and the results of his PCR (Polymerase Chain Reaction) test are all negative. This cutie is ready to find his forever home! Tod's DNA panel shows that he is a Greyhound, Saluki, Borzoi mix - what a cutie! Tod is not small animal or cat tolerant at this time. Tod is part greyhound and all goofball! This petite fellow has a darling face with large, dark eyes that pop against his all cream coat. Tod has the cutest running gait with all limbs splayed out like fireworks. If you have a good sense of humor and a pack of calm females, Tod will be an endless source of entertainment. Tod is a diamond in the rough that you will fall in love within a minute! That first time that he runs to you with his front legs flying in the air pointing everywhere, you will be sold! A lot of things are new to him as he lived on the streets part of his life and he has adjusted very well to a household environment. With the help of his foster dog family he keeps evolving every day. He loves to follow you around and if he wants your attention he will poke you gently with his cute black nose! He makes whiny sounds and sometimes barks when he sees another dog through the window, and he's all love when the door opens. Tod cannot be counted on to be a guard dog! He also barks when he gets super excited but in the end he will stop if you interrupt him and get his attention. Tod's obviously a bit too vocal to live in an apartment. Did I mention this boy LOVES his toys!! He gathers them all around his favorite daybed in the living room and sometimes takes a few outside to his outdoor resting area. One thing you can be sure about, is that the toys will not stay in the toy box as they will be moved one by one to the location he has selected! 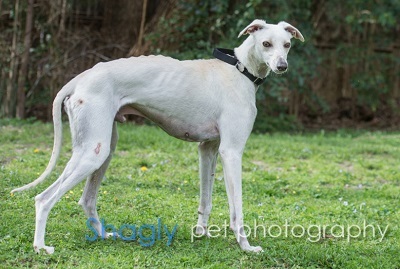 Overall Tod is an energetic boy who needs company. He loves when you show him attention and gently pet him. And he enjoys dog(s) around him that he can play with and guide him through life in a regular home, no kitties please. What he is after is sense of belonging and in return he will love you back and show you his goofy side and will keep you laughing day after day!